The weather was better this morning, but we still got up slow... then the cannons starting going off. Something about it being the 21st of May gets the Turkish all excited, and the do 21-gun salutes with three guns, seven times (look, math!). Breakfast as per usual, then a taxi - we're going to do an unguided tour of the city walls! Well, not really unguided - we had our Eyewitness Travel Guide to Istanbul, which was worth its weight in gold. A combination of history, culture, practices (like how to behave in a mosque) and a variety of tours. And one of the tours is the one we were going to attempt on our own - Along the City Walls. The tour covered more than just the walls, towers, gates and castles of the City Walls, but also a number of other buildings near the walls. 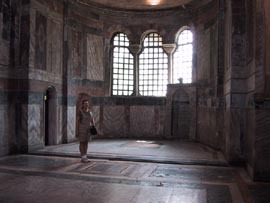 The book stated that of all of the structures in and around the walls, the Church of St. Saviour in Chora is the most outstanding, so we hired a taxi to take us there. 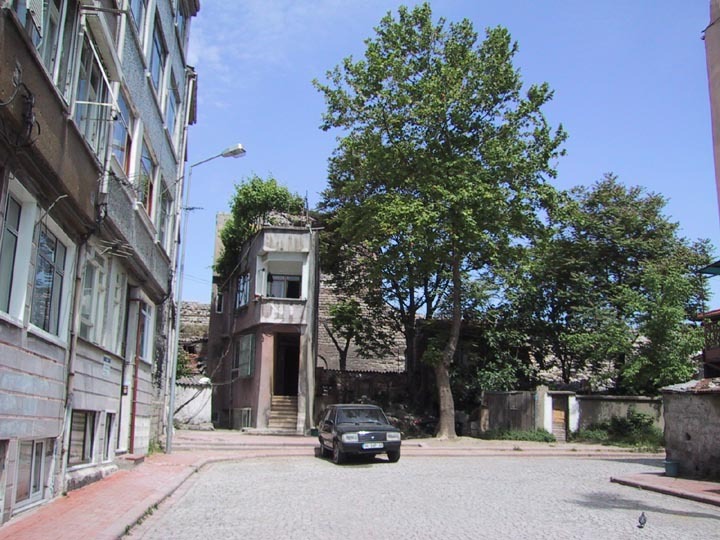 After a sprint down a major highway of Istanbul (they run around the perimeter of the city), the taxi dove back into the tiny maze that leads up to St. Saviour in Chora... these streets were there long before cars, its amazing that cars can negotiate them at all. It gets really frightening when a decent-sized dump truck rounds the corner, barely able to make the turns or fit between the cars. When we finally reached the church... well, lets rephrase that. When we got IN SIGHT of the church, we let the taxi go and walked the rest of the way. There was half a dozen HUGE tour buses trying to maneuver in these miniscule streets, with a variety of assistants, shouting directions in Turkish to help the buses negotiate the road. Our taxi didn't have a chance, it was faster and less painful to just pay him and walk the two blocks in. The tour buses had dropped off hordes of tourists, all with tour guides. Apparently none of them were English tourists - there was German, some Eastern European languages (Romanian?) and Japanese. We took our time and went where they didn't to get great views of a truly magnificent little church. 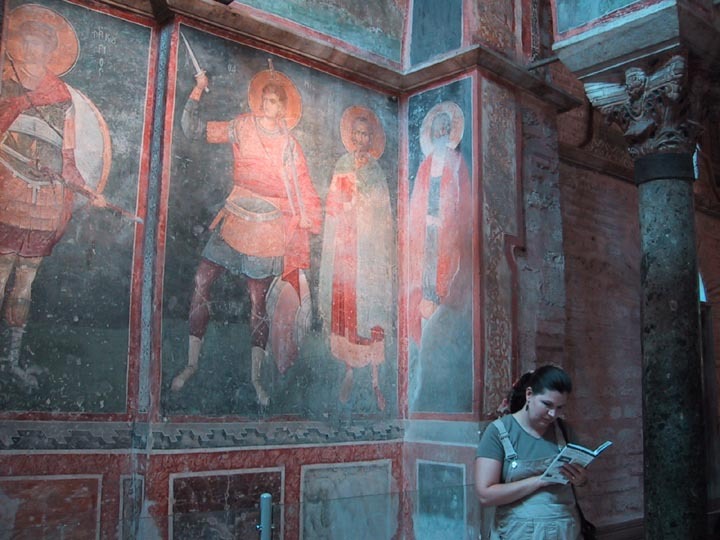 Stacy reading the guide book to learn details about the frescoes that surround her in the parecclesion of St. Saviour in Chora. Stacy examines the ceiling frescoes in the parecclesion. 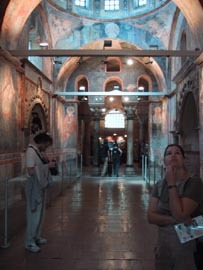 Stacy around the corner in the inner narthex, looking at the mosaics. 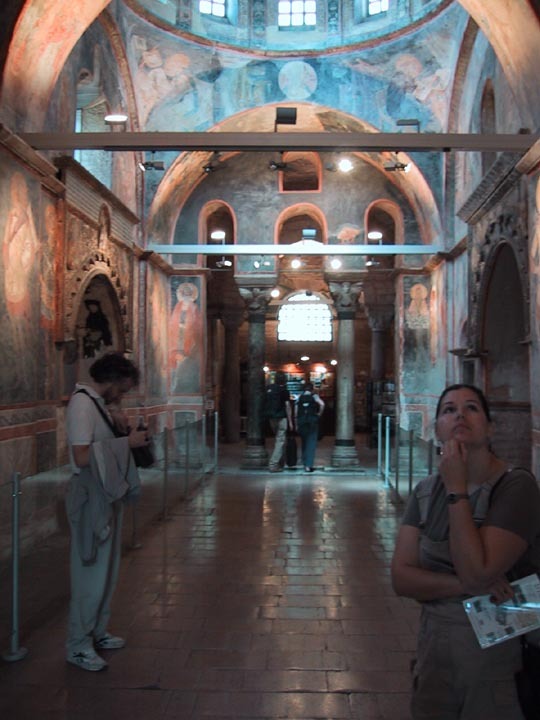 Stacy in the Nave of St. Saviour in Chora. 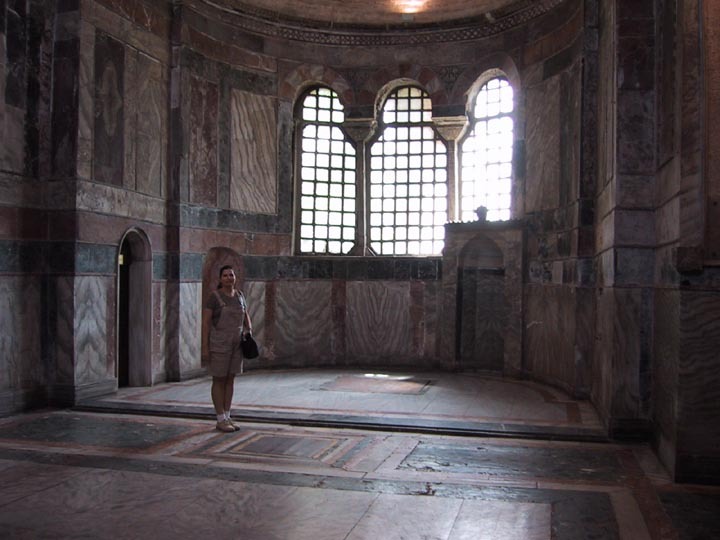 Notice the mihrab on the right side of the little Aspe - this church has been converted into a mosque. 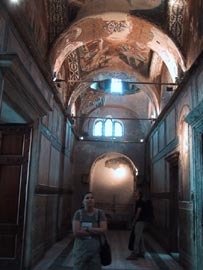 St. Saviour in Chora was well worth the visit - not as vast as Haghia Sophia, but a real demonstration of the beauty of religious mosaics and frescoes. With St. Saviour in Chora behind us, we sat down on the side of the road and studied the map in the book a bit, which indicated a couple of other sites nearby the church, closer to the wall. We thought we could just hike our way there, although the area is very hilly and steep. 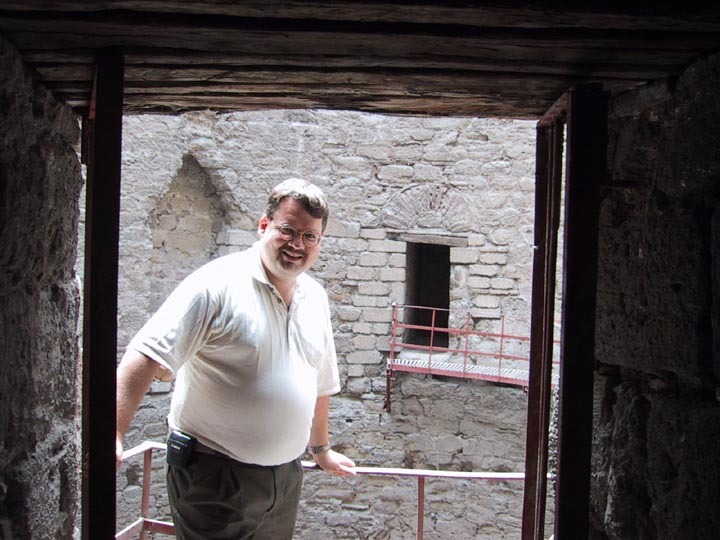 We were actually looking for the ruins of two different palaces - Blachernae Palace and the Palace of the Porphyrogenitus. They were supposed to be close to each other, in fact, the Palace of Porphyrogenitus was thought to be an annex of Blachernae Palace. From St. Saviour in Chora, we knew which way the walls were, and we knew that the palaces were right against the walls. So we headed up hill, toward the walls. 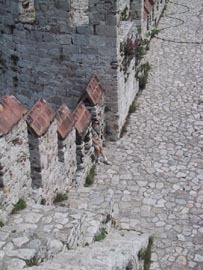 At the top of the incline from St. Saviour, we spotted the old City Wall, with buildings built right up against it. Stacy walks along the old City Wall in search of the palaces - in hindsight, the structure on the left may well have been the Blachernae Palace! At the end of the road, we reach something vaguely palace-like! A close up look at the ruined tower. Ruins are a blast to explore, but we'd run out of things to find in this area of the City Walls. It was time to get moving down toward the other "major" site along the City Walls... Yedikule. We hiked back the way we had come toward St. Saviour until we found another taxi, and with some pointing and single English words, convinced him we wanted to go to Yedikule. He knew enough English to let us know the name is actually two Turkish words: "yedi", which means "seven" and "kule" short for "kulesi" (remember the Fortress of Europe? ), meaning "tower." The place we were going is actually called the Seven Towers - a castle surrounding one of the original gates of the City Wall. 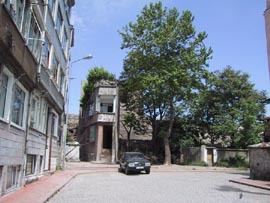 The "old" part of Istanbul (and by old, we're talking 2,000 years or so) is on a peninsula. And so, during the reign of Theodosius II, the walls were constructed along a 6.5km section of the peninsula, from the Marmara Sea to the Golden Horn. It was made up of 192 towers and 11 fortified gates. Construction started in 412AD and completed in 422. Twenty five years later in 447 an earthquake destroyed 54 of the towers, but they were immediately rebuilt - at the time, Attila the Hun was ravaging his way across Asia and Europe, Constantinople needed its protection. And the wall was more than just a wall - it was a moat for keeping the enemy artillery out of range, towers and the outer wall where the bulk of the defense took place, then a road for moving troops efficiently during an assault and finally the inner wall, which was the final line of defense. 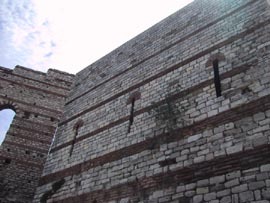 Once built, the wall kept invaders out of Constantinople for more than 1,000 years - until Mehmet II succeeded in breaching the wall, and that was in 1453. And then he immediately repaired it for his own defense of the city! 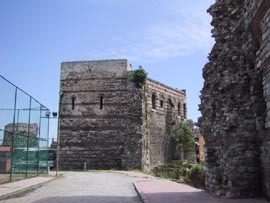 In fact, the Sultans of the Ottoman Empire kept the Byzantine walls in good repair until the 17th century. Perhaps it was just fortunate coincidence, or perhaps the taxi driver knew we were exploring the old City Walls, but our taxi ride took us the entire length of the city walls, from the northern edge near the Golden Horn where the two palaces were, right to the other end beside the Marmara Sea. Four years after Mehmet II broke through the walls and captured Constantinople, he ordered construction of a castle around the main gate of the walls, called the Golden Gate. 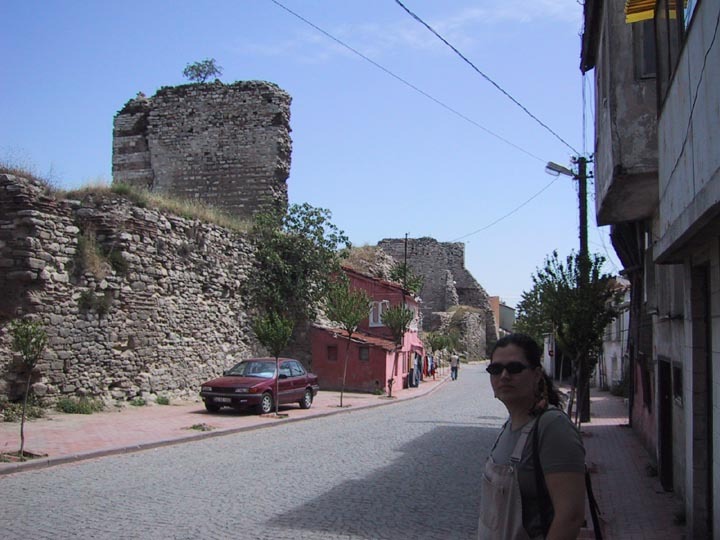 The castle was Yedikule, incorporated right into the then thousand year old walls. 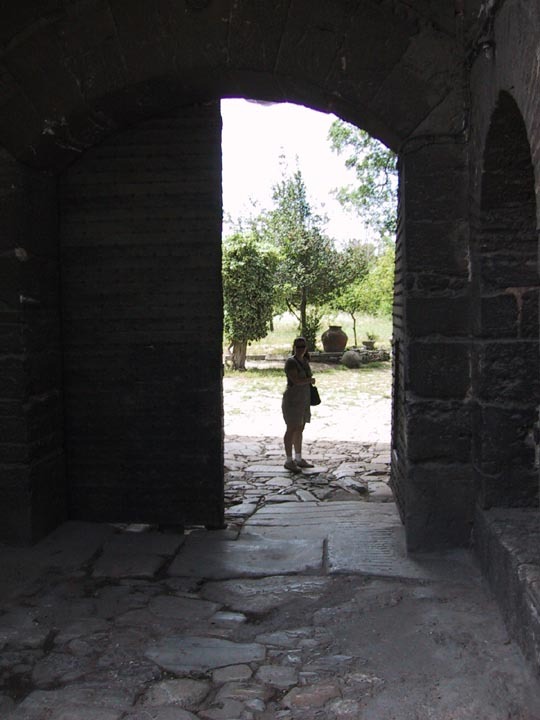 Stacy standing just inside Yedikule after crossing through the only city-side gate. 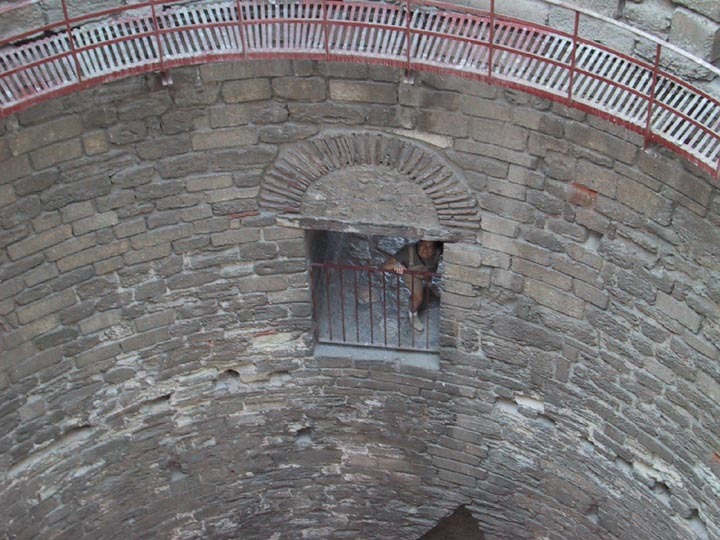 Stacy relaxes between two battlements on the north wall of Yedikule. 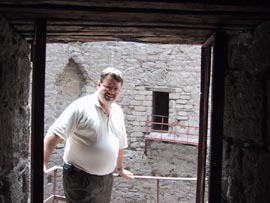 Richard standing on the inner catwalk of the Inscription Tower in Yedikule. Stacy peers up from the entrance passages of the Treasury Tower. We spent several hours exploring Yedikule, there was so much to see. 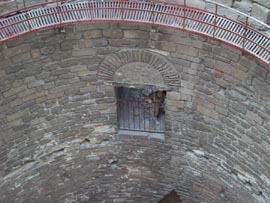 Many of the passages through the towers were poorly lit, so Stacy wasn't too keen to go through them and just stayed on the wall while Richard wandered through dark stairways to the tops of the towers. It was getting on past lunch time when we finally left... unfortunately, since Yedikule isn't a "major" tourist site (although it ought to be, its an amazing place), there were no taxis waiting outside the castle. We started to wander away from the castle, generally in an eastern direction toward Sultanahmet. The taxi driver had warned us that it was 15 kilometers from the Blue Mosque to Yedikule - presumably he was trying to convince us that we should pay him to wait for us, at least, that's what we guessed he was suggesting. But we hadn't bothered, and now we had to walk. We wandered through very Turkish streets, trying to find some more significant roads... eventually we found a road with shops on it, and shortly thereafter, spotted a vacant taxi. We jumped in and asked to be taken to the Grand Bazaar, which is near the middle of the map on the old side of Istanbul. 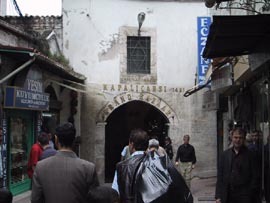 The Grand Bazaar was another structure established by Mehmet II shortly after his conquest of Constantinople. It is a massive maze of little storefronts, filled with aggressive shopkeepers who want to make a deal. Haggling is an expected part of any transaction in the Grand Bazaar. After taking a quick wander around the Grand Bazaar, we decided we needed lunch, and after looking into a number of fairly unappetizing cafes, we gave in to a moment of weakness and went western for lunch - McDonalds. 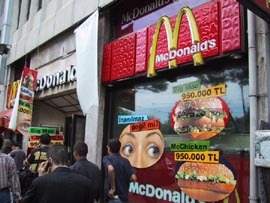 We're happy to report that the McDonalds food in Istanbul is virtually identical to the North American version, although they still use the styrofoam packaging and the wall menu, ad posters and tray papers are all in Turkish. Our only purchasing goal around the Grand Bazaar was to attempt to buy cloth with Turkish prints. 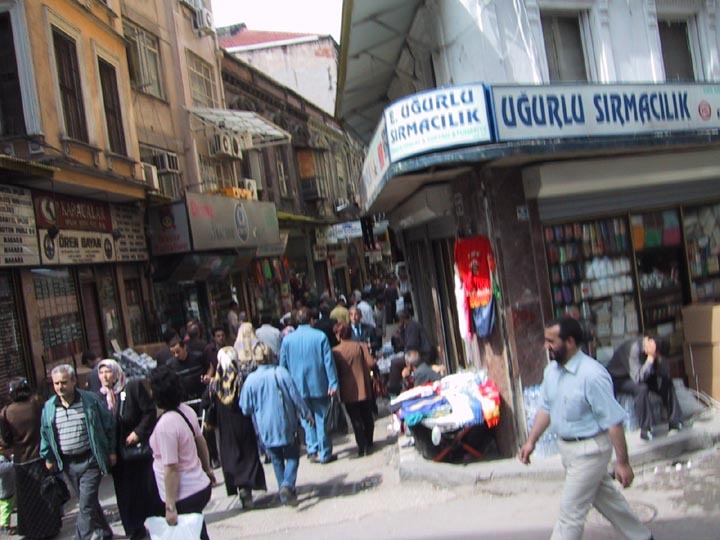 We had been told that there wouldn't be much along those lines in the Grand Bazaar, and we were better off to shop in an area of streets just east of the Bazaar. But we wanted to explore the Bazaar anyway, so we wandered through the Bazaar from McDonalds on our way to the east side to find the cloth shops. Along the way we saw some very nifty things and eventually gave into a bit of a souvenir buying spree - none of which will be revealed here, since it would give away the surprise of the presents we bought. But eventually we extricated ourselves from the Bazaar and went in search of cloth, albeit now with a number of large bags to carry. The search for the cloth shops was largely in vain, but an interesting exploration of the non-tourist side of Istanbul. We got well and thoroughly lost in the maze of streets, and feared we would never find our way out, when all of a sudden we were back at the Bazaar, near the southeast corner. There we spied the Column of Constantine and the Tomb of Mahmut II. We also found a cute little restaurant and made reservations for later in the evening. After hiking back to the hotel, dropping off our bags, having a nap and getting changed, we headed back to the restaurant and had dinner. The Carsikapi Gate to the Grand Bazaar. 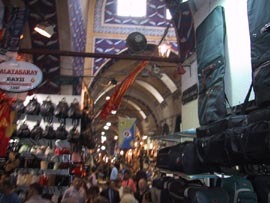 Inside the Grand Bazaar - the entire place is packed with people selling stuff and a few people buying it. Across the street from the Grand Bazaar, a McDonalds! Let's have lunch. Wandering the roads behind the Grand Bazaar in search of fabric shops. 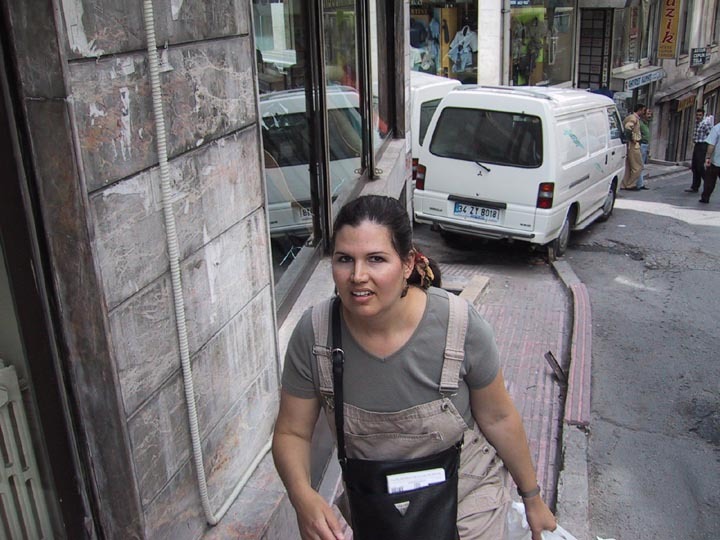 Stacy climbing another steep hill on the search for fabric outside the Grand Bazaar. 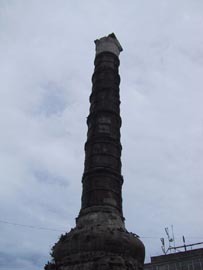 Constantine's Column, just off the main road beside the Grand Bazaar. 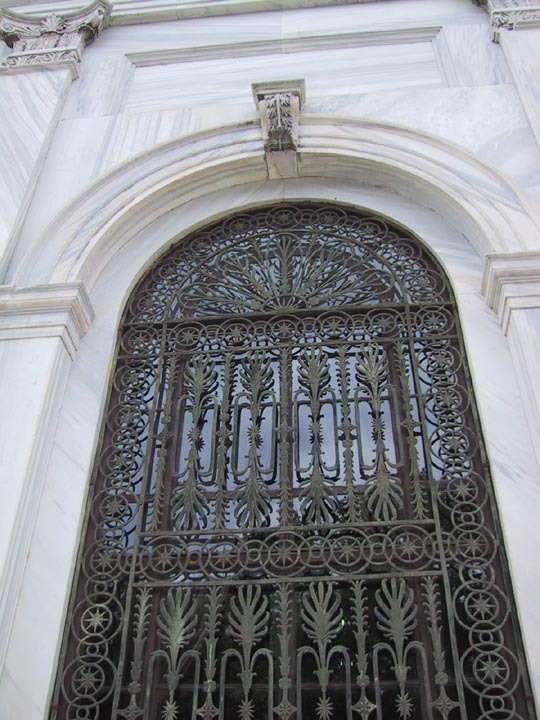 Further down the main road is the Tomb of Sultan Mahmut II. At dinner in the "Paradise" restaurant on the main road near the Grand Bazaar. The restaurant was a tad on the silly side, more a faux Turkish than authentic anything. 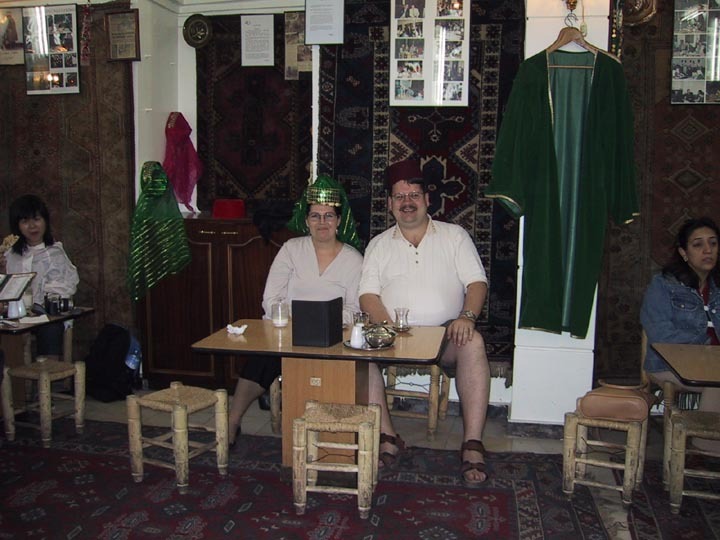 Our waiter welcomed us to Paradise and put a fez on Richard's head and a belly dancer head-dress on Stacy's head. At dinner, we came to the conclusion that random explores are more fun - tomorrow we'd do the same thing on the Asian side of Istanbul!